I’ve noticed substantially higher cherry numbers this year as Carmine Jewell ages. Anyone else seeing this trend? I would say the yields have doubled every year since they started bearing. I normally don’t see those types of fruit increases from one year to the next. Here’s a few pictures so you know what I mean. Carmine Jewell 🍒 - These suckers are everywhere! 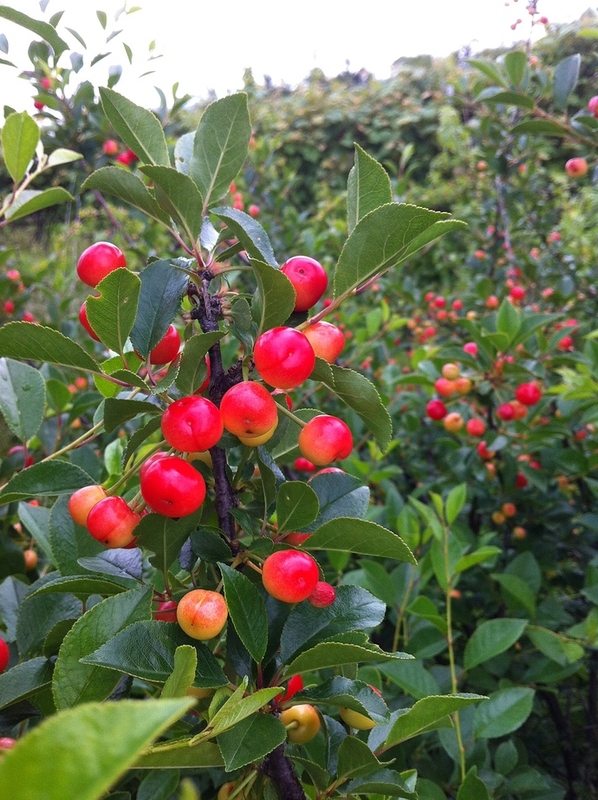 How will grafted prairie cherry plants - Romance Series - grow? Possible to get them growing on own roots? If you could only keep/re-plant/nurture 3 fruit trees? Wowza! Dwarf Cherry, any info? Does anyone use beneficial bacteria/ fungal root inoculants? Growing fruit for wineries & breweries? I can’t eat many sour fruit any more. Of all varieties in this Romance series, I am waiting for Cupid to be available it the US. I want to plant Cupid and Juliett and that’s it. Those look great. I don’t have fruit on mine, but the “bush” or whatever you call CJ is really putting on a ton of growth. I had to cage mine because the rabbits feed on it like its cocaine. i’ve followed this series for a few years now. Killed my Carmen Jewel and Crimsom Passion along the way. Just dip them in sugar Brix doubles or make pies. Ha,ha. I like to eat them fresh au naturel. Nice fruit set on those! Funny how far ahead those are compared to my Romance cherries… mine are at the point when the blossoms are dropping and the cherries are becoming noticeable, but no bigger than peas right now. My pattern of fruiting has been a bit different than yours. 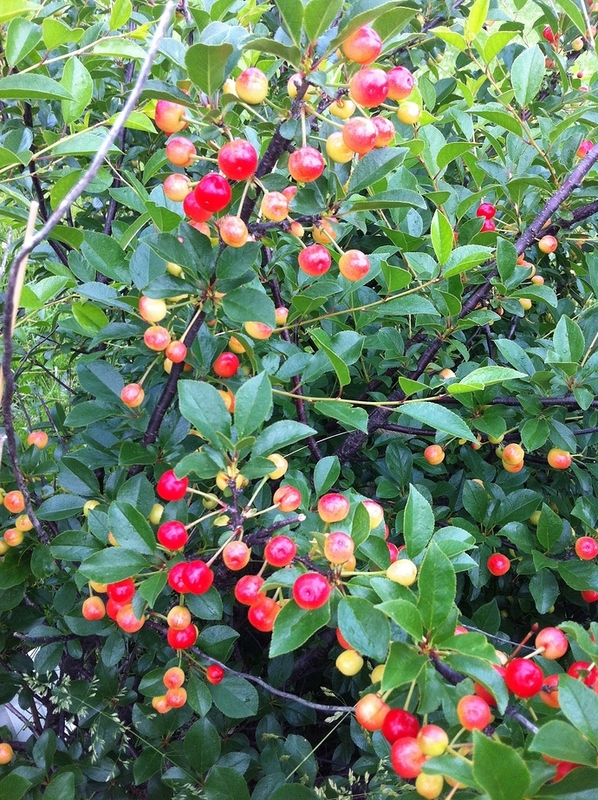 Two of 4 plants produced a few cherries each back in 2013. In 2014 I got maybe 7 pounds from the 4 bushes. In 2015 the production was actually a bit less than 2014 although all 4 bushes did produce some fruit, Carmine Jewel the most. 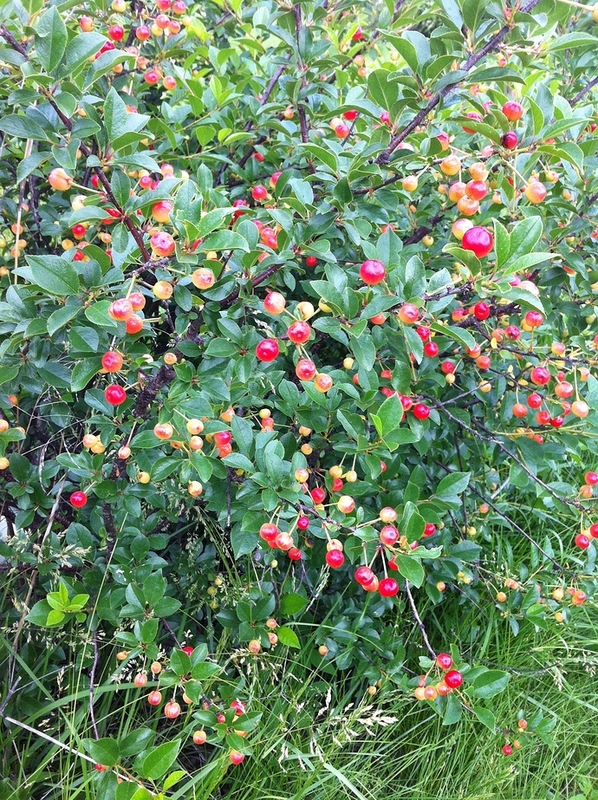 This year it so far looks like a really good fruit set on all bushes, but I know those young fruit sometimes wither and fall in big numbers so I’m not clearing space in the deep freezer for the cherries just yet. Mine have steadily increased some over the years, but I don’t think mine have doubled from one year to the next except for maybe between first fruiting year and the next. But they do seem to be more capable of bigger crops each year. My problem is that for all of the blossoms I had this year there were a fair amount that went unpollinated. Cold weather seemed to impact that I think. Still I have plenty heavy fruit set on all my CJ’s. They’re still green now, but I can see an occasional red dot or two here and there that signals they should start coloring up soon. I also noticed that it seems as they’ve gotten older/bigger that the branches seem a little more bare from the trunk before I start seeing first fruit. Probably all relative size-wise I guess. I’ve been expecting a bunch of these would drop but we had a very mild winter and very consistent rain this year. Before much longer they will be ripe I think. These progressively have increased every year. I thought last year they were kind of light on cherries but they needed a little more time. I gave mine some magnesium, cow manure, azomite, and then spread wood chips on the ground around them which seems to have increased production. Could be their age alone that increased production but I suspect it was a combination of things. 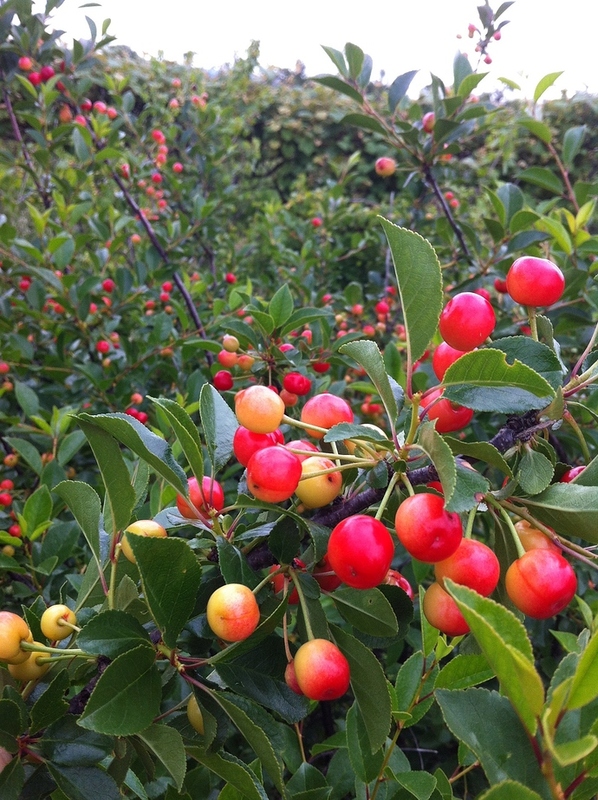 Mine are going to produce for the first time, about 1/2 of the fruit clusters didn’t pollinate, but it still has a decent amount of cherries. I had Cupid and lost it, kicking myself now! Oh Well. Now I don’t have room to add anymore. Nice and clean looking CJ fruits. I also liked that red barn. Clark; In the past I have generally sprinkled 10-10-10 out in early April, but these dang things have been getting much bigger than I thought they would ever be and so I’ve not been doing anything out of fear that I’m just feeding the monster. I guess I don’t know that that is the correct approach though. Maybe after the harvest I’ll give them a shot of something well in advance of winter. But whatever you’re doing it’s working! Nice fruit load. Strudeldog; Very nice setup, and glad to see they seem to like the south too, they look very happy!! The carmine Jewell’s have grown much larger than expected and suckered which was unexpected for me as well. I was told they would reach 6 feet and not sucker. I lean heavy on the PK of NPK because the first number in say 13-13-13 is nitrogen =N which causes additional growth which I don’t need so I use aged cow manure because the second and third number do help me set additional fruit. The wood chips are for macro nutrients and moisture retention. Azomite I’m using for micronutrients. The magnesium is an actual deficiency in my dirt. The azomite is not required but something I have. I use a cup of it per bush every 5 or so years. Some people say the opposite on fertilizing and use more N like discussed here http://groworganic.com/organic-gardening/articles/when-and-how-to-fertilize-your-fruit-trees. One thing I think is very valuable that is discussed is growth of the trees. I fertilize based on growth but also leaf appearance https://en.m.wikipedia.org/wiki/Magnesium_deficiency_(plants) and http://www.extension.umn.edu/garden/fruit-vegetable/nutrient-management-for-commercial-fruit-and-vegetables-in-mn/docs/5886_31-32.pdf . The different points of view on fertilizing are largely due to the soil at the site. Some things like apples need calcium at sites where they have been grown a long time but at my site we definitely don’t need calcium. So two people give advice about apple fertilization and the advice will be different. Good info Clark. I have the wood chips down but I’ll have to source some manure. I bought some in bags from Menard’s that my Asparagus just seem to thrive on, but I don’t know if it’d be the same stuff you’re talking about. Just about like black dirt though. But I thought when my CJ’s bloomed this year the foliage seemed a bit behind the blossoms, but it all appears to have caught up by now and the things look rather normal. That black stuff that looks like dirt (5-10 year old) is what I use. Can I ask how big the CJ plant was when you planted it and how long ago that was? I think this group is on their 6th or seventh year and they were 3-4 inches when I planted them. I don’t recall exactly I have a couple of plantings and one group was very slow to produce fruit and the other was relatively fast. They are planted in heavy clay loam soil.